"As you can imagine, this required strategy." 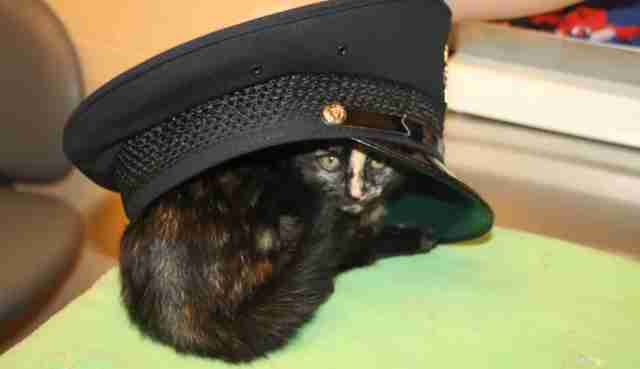 If this sweet little cat named Libby looks quite cozy and comfortable nestled in this unusual makeshift bed — a police cap — it might be because it belongs to the officers who just saved her life. On Monday, Michigan's Livonia Police Department shared the harrowing story of Libby's rescue by a brave officer named Cameron Koss. 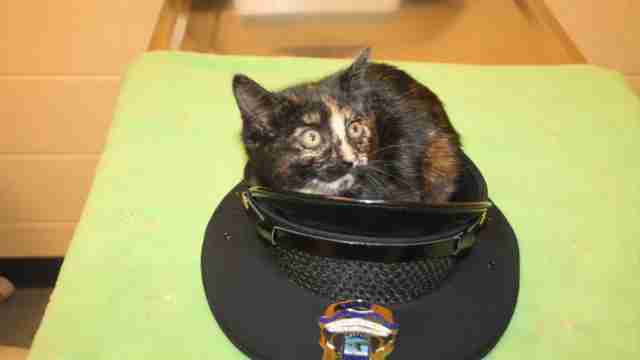 A motorist on the I-96 freeway had called in for help after spotting the terrified kitten in the middle of the busy road. Libby was stranded, and was in serious danger of being run over. Koss didn't hesitate to act. "He encountered the caller on the right shoulder, who pointed out a small black ball huddled down next to the concrete divider (left shoulder)," the police department wrote online. "As you can imagine, this required strategy. Officer Koss and another officer backed their patrol cars down the shoulder to position themselves, hoping for a positive outcome." Here's dramatic video showing how they achieved just that. Libby was now safe — and she knew just who to thank. She even got to wear his hat. 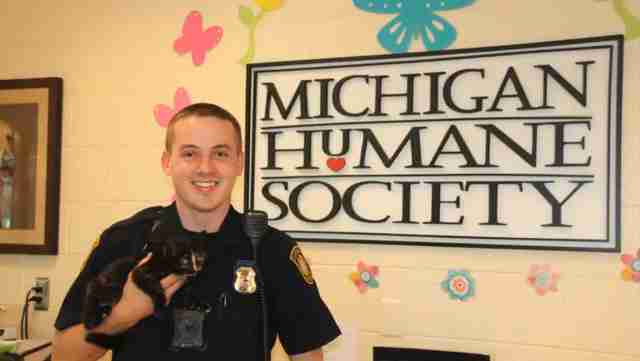 After a brief rest back at the police station, Libby was transported to the Michigan Humane Society. There, she was treated for a respiratory infection, but not before receiving a warm sendoff from Officer Koss. Libby is currently available for adoption at the Humane Society and is hoping to be rescued one more time into a loving forever home of her own — an opportunity made possible thanks to the people who worked to save her.